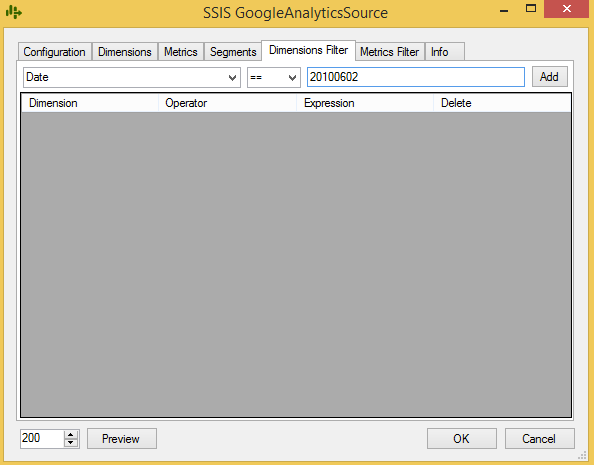 This post is a continuation of the SSIS GoogleAnalyticsSource component description started in Google Analytics for SSIS (SQL Server Integration Services). 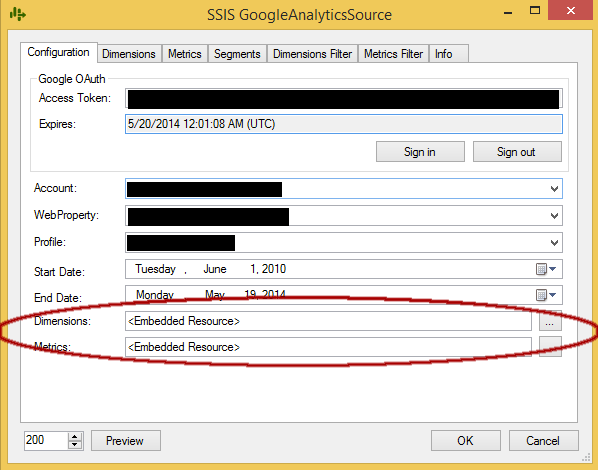 So by now you should know how to extract some basic information out of the Google Analytics. If you are a regular Google Analytics user, you might have changed a lot of changes that the platform has suffered in the years since its inception – Google is always tweaking and improving it. Sometimes those changes are breaking the name of the existing Dimesions and Metrics and so your package one day might get error from the changed name of the Dimension, for example. To solve this, you are able to edit the names of the Dimensions and Metrics by using XML files. 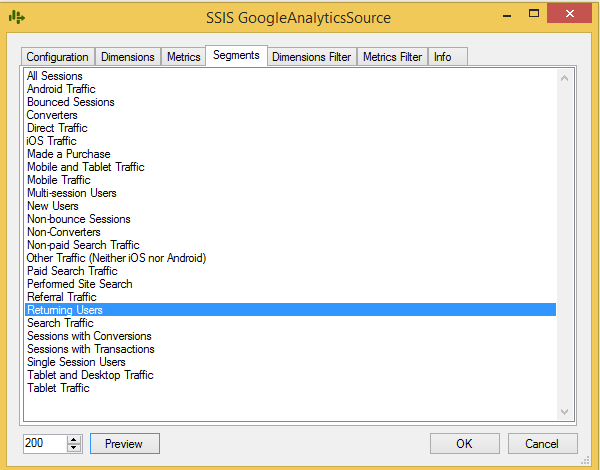 These are the files that contain information about Google Analytics dimensions and metrics, if something has changed – they might be updated by the authors, or if you are in the hurry – you can go and modify them yourself. Simply explained, Segments are the views for the Google Analytics. They allow to limit a type of the information that will be pre-filtered and inside the Google Analytics Platform – focusing on subsets of sessions and users. I think about the M functionalities that is included in Power Query – filter pushing, which basically means that if you are applying a filter to your data that your are reading from a relation data source, than it will be included as a part of the original query predicate. This filters in Google Analytics component are similar functionalities. This property allows you to control the maximum number of rows that Google Analytics shall deliver after request. Capped at 5000 by default, you might want to increase or decrease it based on your current project’s need. Capped by default at 120 seconds, this property allows you to control the amount of time your package might spend waiting for Google Analytics platform to respond on the request. This property allows to make decision if the excesses of information should be removed if the string for example is too long. Be aware that Google Analytics Platform gives you the final information only after 48 hours, which means that todays or yesterday’s statistics are not guaranteed to be correct. You will need to have a paying account in order to have close-to-real-time information. Take a look at this great component and give some feedback in order to make it event better! That’s great tool and great article , Is there a way to include custom dimensions ? ¿¿¿¿ what about to get the real time data (RT: xxxxxxx) into sql server DB ???? I do not believe that there are open source solutions for this. Plus, at least in the past you have had to pay to Google for getting real-time data. I am trying to get the Ga:goalxxcompletions metric. I am really new to the Google analytics. I want to load “goal1completions” and “Goal2completions” from ssis package to my table columns “goal1” and “goal2” . How can I do that? 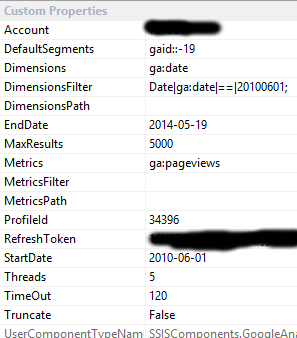 As I see metric defined in metric.xml as “Ga:goalxxcompletions” only. how can i get Goal1 and goal2 from this metric? sorry, but I have no idea. I am not looking at this stuff anymore and I am not interested in investing more time into it.